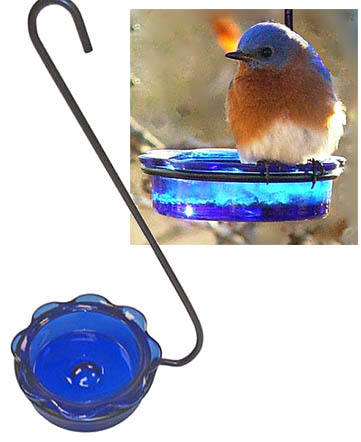 This pretty glass dish feeder will attract a variety of birds. Will hold mealworms for bluebirds. Can also hold sunflower seed, thistle, jelly, oranges, raisins, berries, nuts. Sturdy glass dish will not break in a freeze. Holder, 12 inches long, dish is 3 inches in diameter. Also comes in orange, shown below. Bluebirds are done nesting, but now for the winter they travel around in flocks and will come to feeders in your yard. Many people say, I have never seen a bluebird in my yard. Well, you won't unless you put out what they like to eat. 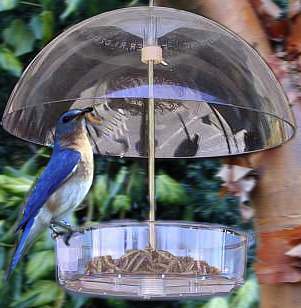 Bluebirds will come to dried meal worms, sunflower hearts, & suet in a feeder. The X-1 is the perfect feeder for any of these treats. Clear and easy to see the birds. Easy to fill and keep clean. The height of the dome is adjustable. It is NOT squirrel proof, but does carry Droll Yankee's lifetime guarantee against being chewed up by squirrels. Yumm! A favorite food of bluebirds. Bluebirds winter in flocks and will come to a feeder of worms, sunflower hearts & suet. This handy resealable pack contains a whopping 3.5 oz. 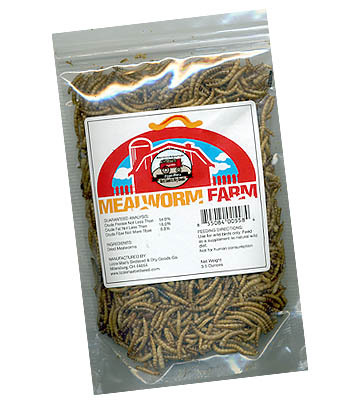 about 500 worms! Also great on ice cream. 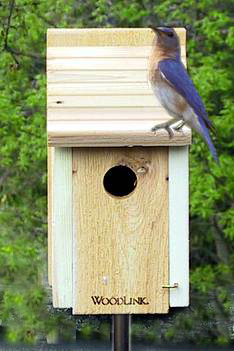 This simple, bluebird box is made of heavy duty 3/4" cedar. It has a 1 1/2 inch hole. Besides bluebirds, it is suitable for any songbird that uses a house such as chickadees, titmice, Carolina Wrens or Nuthatches. Easy to open, easy to clean. This wooden predator guard will add depth to nesting box entrance making it harder for a predator to reach in. Can also put over a hole that has been chewed. 3 inch square with a 1 1/2 inch hole.  Can be used over a smaller hole. Comes with predrilled holes and 2 brass screws. 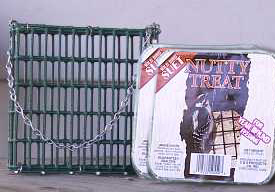 This wire mesh suet cage has small openings to make it more difficult for squirrels to eat the suet. You get two suet cakes, flavor may vary, and the suet cage. 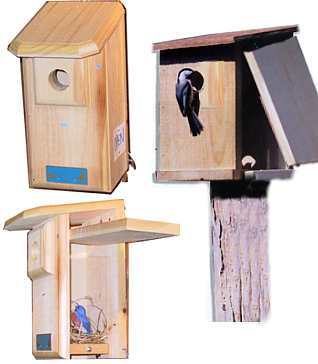 Our Observation Birdhouse lets you take a look in and see the nesting action. The parent will fly out, but come right back. The door is kept closed all the time and only opened to take a quick peek through the plexiglass window. This house will attract bluebirds, chickadees, nuthatches, downy woodpeckers, wrens, basically all cavity nesting songbirds. Made of durable cedar with a built-in predator guard on the front. 1 1/2": Bluebird, Carolina Wren, and all birds using a house up to this size including the above. 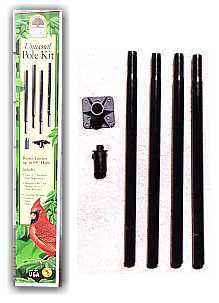 Mount feeders or birdhouses with this handy pole kit. Comes in 4 sections, 1" diameter, total height 68". 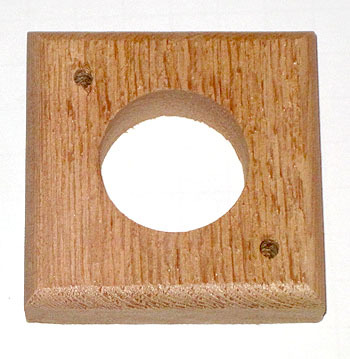 Comes with a flat top to mount on birdhouses or wooden feeders and a 3/4" threaded adapter to fit most tube feeders. For you guys who think things need to be really tall. One end is crimped to fit into a 1 inch pole, the other end is a 1 inch opening. 19 inches long. Will work with the Universal Pole Kit and the Absolute Squirrel Proof Feeder.